It is very late. I am walking towards Jamaica High School track and the l ast few minutes of August 26th are dashing away from me with each dim stride. The promise of August 27th, with all its sweet poignant significance will soon beckon me. But for now, as the night embraces me with its peaceful stillness, I suddenly remember what it was like taking this same walk for the first time 30 years ago. I feel like I too am once again about to step giddy and nervous to the starting line for the 47 mile race. Just as I and 37 others did for the first time in 1978. My footsteps ec ho in the darkness. My bustling shadow pulses methodically on and off as I walk under the street lamps. My mouth goes dry and my heart begins to race. I am jolted by the recollection that I felt just like this before the first big run, and also probably, each and every time I made my way down this same road before this monumental race. What amazes me at this moment in time is the irony of this experience. How we so often impatiently demand that time and its fragile fleeting seconds vanish more quickly before us. Yet now I am staring over the brink of a great precipice. Before me lies a vast chasm 3 decades wide. 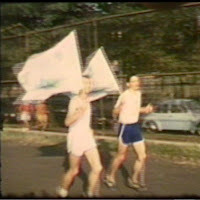 I am however just going over there to observe the start of the yearly 47 mile race, which has been held there since 1978 to honor Sri Chinmoy's birthday. It has been at least 15 years or more since I last ran, and I certainly have no plans of doing so tonight, but still I feel overwhelmed with all the nervous excitement and giddy tension as if I am about to run as well. In 1978 38 of us stepped up to the starting line at just past midnight. I, and most others had run no further than a marathon before this. 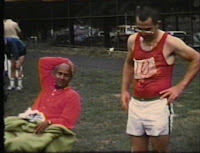 At the time, 47 miles seemed an almost impossibly long distance to run and yet Sri Chinmoy had invited us to try. It was his birthday after all so why not. I was young, and fit, and it seemed like the best possible way to please my Spiritual teacher. After all, self transcendence was so much a part of what his life and inspiration were all about. In our current age of super long races the distance now seems so miniscule compared to the distances the Sri Chinmoy marathon team puts on today. For the 3100 mile runners this distance is a joke, compared to how far they have to run each and every day. But for someone who had not run further than 26 miles, another 21 miles over the challenging streets around Jamaica High School seemed like a distance that would take you to the end of the earth. Virendra came in second that first year and though he did not complete the race in 79 he came back in 1980 and did something miraculous. He not only won the race he set a world class record that no other runner since has come close to. His time of 5:09 is almost unbelievably fast. No one has even run within 30 minutes of that time in 3 decades. 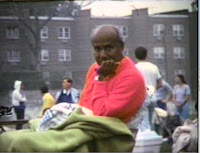 Last September while celebrating his son Jowan's birthday Sri Chinmoy said to Virendra, "next year he will come and break his own record." It would be the last words that he spoke to Virendra before he passed away in October. He would share this with me in the chaotic months that followed and my mouth just dropped in amazement when he said it. When we spoke he was far from being the fit young man of 1980. It would be gentle to say that he was overweight and out of shape. At the time he was well over 200 lbs. and was probably not able to even run the 47miles little alone break his superb record. His strategy for preparing himself for, what can only be called a divine challenge was to leave the country and focus solely on the task. So he went to Peru, to use the mountains, and altitude to get into shape, and to loose his goal of 76 lbs. Tonight, after being away for 8 months, he has returned to a familiar battlefield. He has lost more than 60 lbs. and is race fit. In a few minutes he will attempt to shatter impossibility itself. Tarit, who is no stranger to ulta distance races takes on a job of working with counters. Sanjaya who turned 70 this year is a familiar presence in the counting huts. There seems no shortage of enthusiasm amongst the counters. Tirtha who ran the 10 day race this year will find 47 miles not far. Karnayati also a veteran of multi day racing ties up her shoes. Palash performing on a different stage. Yuyudhan and Prabuddha have been here many times before. Abhaya and Iris getting bibs ready and Prachar...well, let's call it relaxing. Let us not forget that he won the race in 1980 in 6:17 and also won the mile that year on sports day. Gaurima is also running tonight. She ran and won the first race here in 1978. She would win the race the following 3 years until a gifted young Australian athlete named Dipali came along. 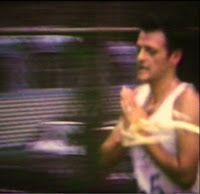 Dipali would first run in the 1981 race, in which for one time only the race was 50 miles. The distance was to mark Sri Chinmoy's 50th birthday. Dipali came second that year. She has won this race for 22 years straight. She runs here tonight not to win but to do her very best. In no other race can she offer up her heart's gratitude in quite the same way, to the one who has so inspired her life. It is also happens to be her birthday as well. Virendra stands on the starting line fearless. He has prepared himself as best as was humanly possible. Now he is about to enter into a divine game. 160 runners stand in silence on the track. It will be a long night for all who run here. The results of each one's experiences though are a gift, offered now directly to a teacher whose presence can be still felt in their hearts. Some will remember how he used to inspire and encourage all who ran here. 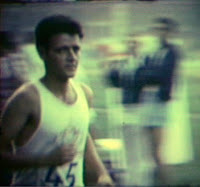 In that first race he would spontaneously start to run on the course himself shortly after the start. He ran for 23 miles that night. Virendra will charge off from the starting line and run courageously. He will take the lead at the outset but has Stefan always close behind. Only he knows what those last words of Sri Chinmoy meant to him. The story of his life and his heart's journey are his alone to tell. This much I know. He went to extraordinary lengths to fulfill his last request to smash his own record at this race. It was an unbelievable difficult challenge to take on and yet he did it willingly and with respect and gratitude. Perhaps, if he had not broken his collar bone while climbing in the mountains there would be a different story told here this night. Yet this man who made his way alone down a mountain with broken bones makes no excuses about his performance here. Arpan is another who ran here 30 years ago. He still competes in running events and seems to show little signs of age. Tristan represents the current generation of gifted runners. He runs so easily and patiently throughout the long night. Dipali is tireless in her epic night of running. For 22 years she has run and won here. She was unique in that she shared the same birthday as her teacher. There can be no better gift, than what is offered up over 47 miles and in now her 23rd year here. There are so many stories that could be told here. Each who runs here in some way finds transcendence, if not with the battle of time and distance than with some other aspect of limitation in their lives. The score board reveals one kind of reality on the outer plane. The journey made within is not so easily revealed. Gaurima, joyous and light on her feet passes by the scoring table. 6 hours and 13 minutes after having strode forward from the starting line Stefan will cross it again, and be this years champion. It will be his first win and he says, "I did not think of winning or loosing. I did not set the goals." It would not be easy. He would see his lap times slow from 8 minutes to 10 minutes. He says though that when he was having a tough time he, "just let the pain go and started running again." 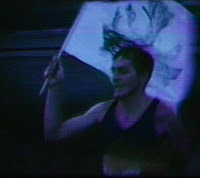 He feels his win was all grace, and because he had dedicated his race to his late teacher it made it all worthwhile. 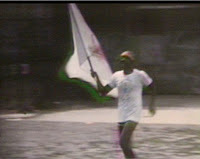 Virendra the record holder will be there at the finish line to greet Stefan. He will have run courageously for 20 laps of the race. With no hint of understatement he says, "It was hard for me to do that, not so much physically." Few can really appreciate what it took to set the record of 5:09 28 years ago. Stefan who took more than an hour longer to complete his race knows all too well. Dipali comes onto the track for the last time and receives the flag from her brother. She will say, "I couldn't believe I had the flag. Of her result of 6:35:06 she is extremely grateful and says, "I haven't done that time in years." Usually she has run slower than that over the past 10 years. Her race is the perfect gift, to the one who inspired her to run and now runs within her. Her brother Kishore is there to congratulate her and perhaps remember what it was like when he and Animesh completed the race here for the first time in 1978. In 1980 he won the race himself. It is just a perfect moment for the Stott family. Tarit delivers this monumental understatement to his daughter, "you have done the 47." Tristan is the second boy and coming in together in third are Enrico and Giovanni. Each who runs the 47 mile race experience so much joy, even after running what at first seemed so far to go. To finish is always a delight no matter what the time maybe. Gaurima seems always so delighted. On the left she carries the flag in her first race. Now she has more than enough energy and enthusiasm that she even has time to encourage the counters. She will finish in 9 hours and 37 minutes. Arpan crosses the line for the 25th time in 7th place. His time of 7:08:17 is 7 minutes faster than his time in 1978. He will tell me that mentally the experience is incomprehensible. He says the race for him is just, "unbelievable grace." 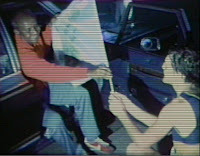 Pratyaya has been the race director since the beginning. She tells me it is always inspiring. She finds it rewarding at how well everyone works together. 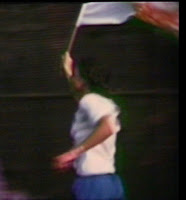 She stands in front of a picture of Sri Chinmoy running the race in 1980, the second time he ran the race. He beat his time from the previous year by more than an hour, it was 11:27:3 3. As for Virendra, he will tell me, "I gave it all I had. I felt Guru was happy with what I did." He tells me that for the first time in years he, "felt like a runner again. It was really intense." He is now back in Peru and training again. His goal, and his heart's promise are not yet complete. He plans to come back and try again next year. For those who have never run the 47, it is difficult to describe all its myriad challenges, and the inexplicable joy of completing it. It is even more difficult to describe what it was like to see your Guru running this same race himself. To come around a dark corner and see him bobbing along under the dim street lights in front of you. He is still running of course, but now in our hearts. You will only have to look and you will still see him there, running and running.